An introduction to stand-up comedy hosted by a professional comedian. Write and develop your own 5-minute stand-up comedy routine. Perform your act on an open mic comedy show. Know what it takes to get big laughs like the pros! Please, click here to purchase access to the Comedy101 Beginner Stand-up Comedy webinars. Attend the webinar and get a matching online course! Private entry to the webinar. 90-days access to the companion online course, How to try Stand-up Comedy and get Big Laughs. Tons of tips and professional advice for developing your stand-up comedy routine. Professional stand-up comedians in need of a new 5-minute set. Advanced comics with a strong desire to showcase their best material. New comedians that want to get the most out of open mic comedy shows. People that want to try stand-up comedy. 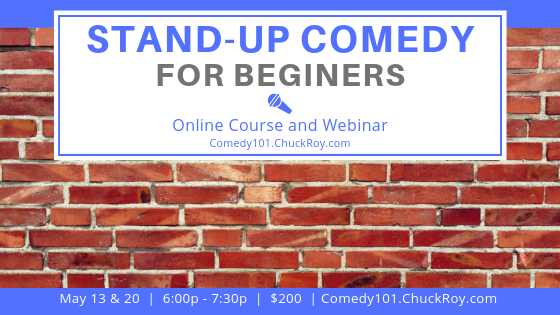 Purchase access to the Comedy101 Beginner Stand-up Comedy webinars.